Artesia High School Class of 2017 graduate Isaiah Weideman poses with his 2016 Player of the Year trophy Monday at the Daily Press offices. 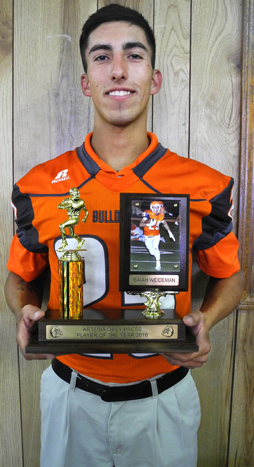 Weideman, a senior running back on last year’s Bulldog football team, was selected for the honor in its return after several years of not being awarded. Weideman was a standout back for the ‘Dogs, rushing for more than 700 yards on the season and using a savvy and powerful running style to both create first downs and break for big runs. Weideman has enlisted in the U.S. Marine Corps and will join their ranks in August.